The project – ‘Garden Life’ – was awarded £10,000 from the Commissioner’s Community Fund in April 2017, with the project running for twelve months up to May 2018. The aim of the project is to help reduce youth offender behaviour and re-offending by creating a pathway into work through helping those engaged in the project to recover their self-worth and respect by connecting with their local communities. Speaking of his visit to the garden, Peter McCall said: “This is a great project, teaching real skills and the discipline of the workplace. I was really impressed by the attitude of the participants on the project who are clearly well motivated by practical work and taking a great pride in what they are doing. “The project is also making a real contribution to the local community by keeping what would otherwise be an eyesore patch of waste ground well cultivated and tidy, and by passing their produce on to local foodbanks and hostels. Some of the young men are now looking to establish their own gardening businesses. The community garden can be accessed by young people with special needs or young people involved in the criminal justice system. They can come and undertake volunteering and work experience whilst they consider their next step. There is also an opportunity for the young people engaged in the project to gain national accredited qualifications. 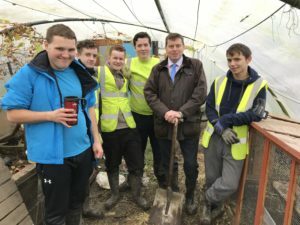 The produce grown by the young people will be given to food banks and hostels, encouraging the young people to become constructive contributors to the community. The project will support young people after the program to find work or to move into further education. The project targets 14 to 24 years at risk of dropping out of school, young people with learning and physical disabilities, young people who are considered unemployable and may be engaged in youth offending. On arrival, each young person will work with project leads to develop a personal action plan, their progress will be measure throughout the course and distance travelled as a result of taking part in the program will be recorded.